Our methodology is based on empowering participants to improve their performance in their organisations. CIID capacity building programmes are designed to assist organisations and participants solve real infrastructure-related challenges. We focus on output and results, and build personal and technical competencies for participants to fulfil their work objectives effectively and efficiently, and thereby contribute in the most productive way to their organisation and its goals. Our work-based programmes are not traditional classroom-based training. In addition to transferring knowledge, we use real examples to train participants how to design and deliver infrastructure programmes and how to solve the problems they are likely to face. As much as possible, we relate the training to the actual work and projects of the client organisation and participants. Participants learn from each other through constructive feedback and by comparing their own practice to best practice. Shorter programmes, including workshops, do not generally include the Personal Development Plan or fully-fledged individual and group projects, but they are designed to be as interactive as possible within the time frame allowed. CIID programmes are customised for the client organisation, the specific projects in hand, the experience of the client organisation in the sector and the level of experience and expertise of the participants. The programmes are designed to give exposure to international best practice and we engage sector specialists in the design and delivery of the programme. We focus on organisational development, not just the goals of a specific project. Development projects often fail because of a lack of organisational integration – both vertical and horizontal. 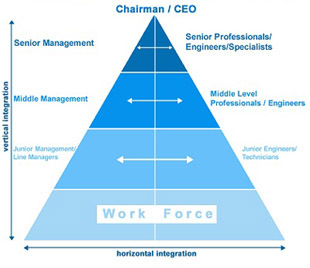 The two "sides" to an organisation are its management and its technical specialists. All too often, managers are not sufficiently conversant with the technical components of the organisation's activities and technical specialists are not management practitioners. This is true in both the public and private sectors, and is increasingly true in an era when job migration is more frequent. CIID programmes work to overcome this lack of connection between management and technical expertise. We bring managers and technical specialists together in the training programmes and workshops. Through the structure of the programme, we encourage a dialogue so that each side can better understand the challenges faced by the other, and can thus work more effectively and productively together in the future. Problems in project execution also occur because of a lack of vertical integration. Senior and middle managers are not familiar with the detailed work and challenges of junior managers and supervisors. Senior technical specialists may not be conversant with the detailed technical work on the shop floor, especially when they have come into the company or sector at a senior level from another sector. The same is true in the reverse direction, where junior operatives, supervisors and managers do not have a broad understanding of the organisation as a whole. CIID capacity building programmes aim at overcoming these challenges and increasing the vertical integration of an organisation. We offer programmes, where required, for all levels of an organisation. Another common problem in infrastructure project implementation is the gap between standard practice in the public and private sectors. This is increasingly important when development projects have international funding and partners who demand adherence to global best practice. The CIID team has international experience in both public and private sectors, across a broad spectrum of sectors.